To follow all of the other new reveals and displays at NYCC, check out our sister sites TFW2005 & ToyArk! You can also keep up with their updates on social media @tfw2005 and @Toyark! Tamashii Nations 2017: Soul of Chogokin Dragon Caesar Officially Unveiled! As though Burai himself commanded the great beast to appear, we have finally been treated to the official unveiling of the Soul Of Chogokin Dragon Caesar (MMPR Dragonzord) at Tamashii Nations 2017! This gorgeous companion piece to SOC Daizyujin/Megazord was teased some months ago with initial design sketches having been released by Bandai Japan. Now, as Tamashii Nations 2017 continues to surprise us with new reveals, the SOC Dragon Caesar figure is on full display. We don’t currently have any confirmed information about it’s release date, format, or pricing. As soon as any of that information comes to light, we’ll be sure to share it with you. These images came courtesy of Amiami. 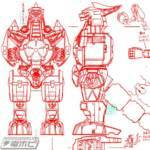 Collectors have speculated since GX-72 Daizyujin was released it’s been speculated whether it would sell well enough to warrant the release of more Zyuranger mecha. And Dragon Caesar has been at the top of many Japanese and Western fans’ wishlists. Well wait no longer, it appears that Soul of Chogokin Dragon Caesar is now in production! Dengeki Hobby has released a scan of a the initial design work for Dragon Caesar, seen here via @TendouToys on twitter, seemingly confirming it’s forthcoming. While there are absolutely no release details available right now, this clearly points towards this mighty figure being released sometime next year. We’ll keep you up to date as more information becomes available for this release. 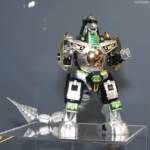 Mighty Morphin Power Rangers Legacy Dragonzord Gallery! The long wait is over! After tons of anticipation and fan demand the mighty Legacy Dragonzord has finally been released! Though it’s been out for a little while now, this sought after piece tends to be hard to come by through regular retail. But TokuNation was lucky enough to get it’s hands on one for a full review & gallery! 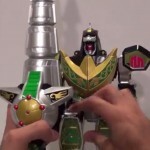 The Legacy Dragonzord is of course an update the classic DX Dragonzord/Dragon Caesar toy from the original Mighty Morphin Power Rangers and Kyoryu Sentai Zyuranger toylines! Released at physical retail exclusively through Toys ‘R’ Us this figure is already hard to find much like the Legacy Megazord. Which speaking of, this figure is compatible with the Megazord! The Dragonzord is a fierce machine on it’s own, but combining it with your MMPR 2010 or Legacy Megazords can create the Dragonzord Battle Mode and Mega Dragonzord, the second of which will prepare you for the upcoming Legacy Titanus! This update to the 20+ year old Dragonzord toy has been long awaited by fans of Mighty Morphin Power Rangers and of the original Green Ranger. So how exactly does this figure stack up to the classic? Read on to find out! And as a special mention for this gallery, TokuNation’s newest Photo & Content staff member ThatRangerGuy was kind enough to take a couple of comparison shots of the original DX Dragonzord & Legacy Dragonzord for us. We’ve assembled a full review & gallery of this latest release in the Legacy toyline for you after the jump. Simply click “Discuss on the TokuNation Forums” at the bottom of this post to be taken to over 60 images and a step by step breakdown of this awesome toy! 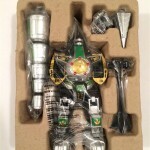 In case you missed it, the Legacy Dragonzord has been released from ToysRUs.com. Hundreds of fans have been receiving their Legacy Dragonzords this week, and two friends of the site, @Peaugh and @hassanahmed120 received theirs and took the time to do video reviews of these figures. Check out the video review from @Peaugh below! And also check out the video review from @hassanahmed120 below! We have our own Legacy Dragonzord Pics and Reviews thread, so if you want to share some cool images or your own video review, please feel free to do so there! And stay tuned to TokuNation for our own extensive image gallery of the Legacy Dragonzord. It’s a good time to be a Power Rangers fan! Time to get those wallets ready! Fans have been receiving notifications for a few days now, but if you weren’t able to pre-order the highly anticipated Legacy Dragonzord earlier this year, you can now simply order the item and have it shipped directly from ToysRUs.com! To order the Legacy Dragonzord, simply click here and place your order! The item also qualifies for free shipping and is available a month earlier than Amazon.com and other retailers. If you don’t feel like waiting, or you didn’t take advantage of any special coupons or deals with Amazon, go ahead and place your order and await this magnificent beauty of a figure. Did you get your Legacy Dragonzord yet? 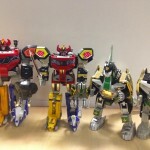 Share your thoughts, pictures, and the sadly placed zord-builder ports pictures on the forums! GO GO POWER RANGERS! To all our friends up north – head to Toys’R’Us! The Legacy Dragonzord was spotted and purchased at Toys’R’Us store in Vancouver by ayane from the RangerBoard forums. ayane also managed to take a ton of pictures of the Legacy Dragonzord. We’ve mirrored all 20 images here for your viewing pleasure. The original images were shared on RangerBoard. NOTE! The head-fin on the Legacy Dragonzord appears bent. This is apparently due to packaging – the plastic wrapped around the fin is too tight. There are many fixes for this and if it turns out to be a mass issue, we’ll share some tips and tricks on how to get it fixed. Power Rangers Legacy Dragonzord Preorders Open at Amazon! 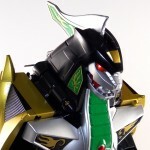 The much-desired Legacy Dragonzord is now available for pre-order at online retailer Amazon.com! No release date is mentioned but previous solicitations suggest a mid-June release window. 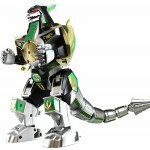 At the time of writing, Legacy Dragonzord is priced at $70.16 USD and qualifies for Free Shipping! A decent price and a much more convenient venue for buyers who don’t have regular access to Toys R Us! One of our sponsors, EntertainmentEarth.com, has some great items set to arrive in March, which is closer than you think! Check out these great tokusatsu items set to arrive in March of 2014 at EntertainmentEarth.com! And don’t forget – you can pre-order the Mighty Morphin Power Rangers Legacy Dragonzord slated for a June 2014 release! Please check out our sponsor EntertainmentEarth.com! The Bandai UK Facebook Page has put up some excellent preview images of the upcoming Legacy Dragonzord! This mini-gallery gives us our first side-by-side comparison with the original Dragonzord mold as well as shots with all Dragonzord combinations using both the ’93 molds AND the Legacy molds! Legacy Dragonzord should be on its way to store shelves VERY soon! Keep a lookout for this fantastic piece of Power Rangers history!